The Viet Nam High End Show 2009 was held in Ho Chi Minh City from September 25th to 27th at the Continental Hotel, one the most ancient luxuries of the city. This year, the Viet Nam High End Show welcomed many audio brands new to this market such as Lansche Audio, Magico, VTL, dCS, Einstein, Avalon, Crystal Cable and Rogue Audio. Vietnamese audiophiles had a chance to listen to new high-end components which had just landed days prior to the show such as the Lansche N°. 3/N° .5 speakers, Magic's V2/V3, Dynaudio's Consequence Ultimate Edition, Avalon's Time, VT'sL Siegfried, Dcs Scarlatti, Marantz KI Pearl, Denon 2010 Series and so on. The show had two display areas, the first one an open floor which displayed brands like Marantz, Denon, BIK, NAD, PSB, KEF, Jamo and Klipsch in booths. The most exciting part of the show was hosted on the hotel's third floor. 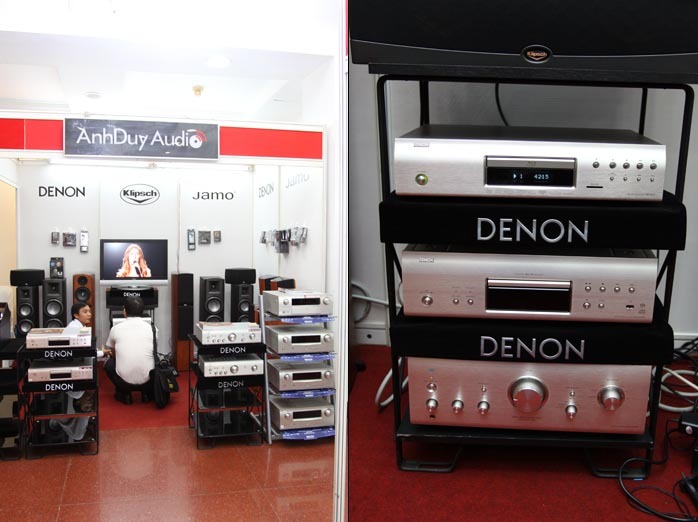 There 13 suites were filled with 52 high-end audio brands and their flagship products. We also welcomed specialists from VTL (Bea Lam), Acapella (Hermann Winters), Einstein Audio (Volker Bohlmeier) and Isophon (Roland Gauder). They gave some interesting mini seminars about their history, philosophy and the key technologies of their brands. Mr. Hermann Winters, director of Acapella and his wife; Mr. Volker Bohlmeier, director of Einstein Audio. Mrs. Bea Lam, operation's manager of VTL; Mr. Nguyen Dung, Nguyen Dung Electrics distributor; Mr. John Batliner, VP of the Harman Group. Marantz booth with all new products from their 2009/2010 lineup such as the SR6004 receiver, the KI Pearl CDP/integrated and the 6300 CDP/integrated. Marantz KI Pearl, the foundation of the 15 Series. Mr. Ken Ishiwata has upgraded both the integrated amp and CD player to a higher performance level according to his sensibilities. High-quality Karaoke products from BIK of Japan. Denon booth with the new 2010AE 2-channel series and many new receivers. One of the best setups at the show were the Magico V3s amplified by the well-known combination of Ayre MX-R/KX-R with Wadia's 781i and Crystal Cable's top-of-the-line Dreamline. One felt glued to this room, the soundstage was amazing and one could experience what people call the "magic sound" of Magico. Lansche Audio's N°. 5 is a masterpiece in both design and sound reproduction. The Corona ion tweeter sports extension to 150kHz! Lansche Audio's N°. 3 had a shiny cabinet and a very smooth sound with great detail. The award-winning Ayre MX-R mono amps combined the virtues of both tubes and transistors. Crystal Cable displayed their latest including the flagship Dreamline and newer Bridge/Dreamlink. Alas, no Arabesque.